FandCo and Tala worked with 8 emerging designers and makers using Tala’s sustainable, LED bulbs as inspiration to create lighting fixtures that can be manufactured anywhere in the world, using accessible digital manufacturing techniques. With a time limit of five days and by using only 3D printers, CNC machines and laser cutter the creative talents responded with amazing designs to this challenging brief. 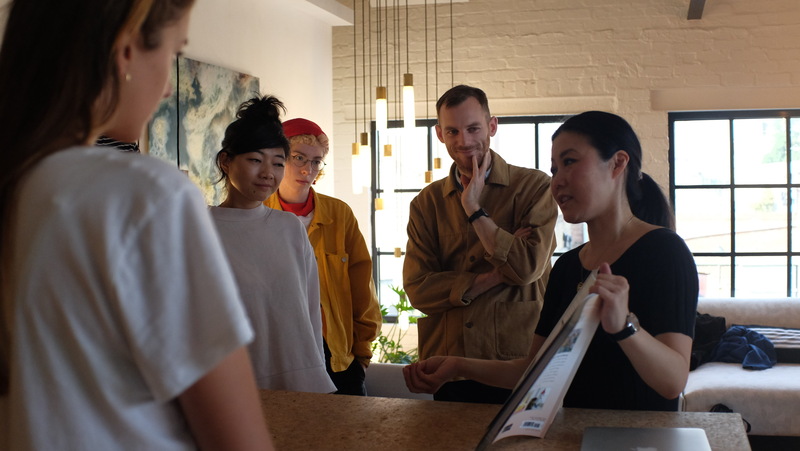 During the workshop Artists like Coco Sato, known for translating traditional japanese aesthetics into modern art forms, and Award winning Designer Tom Raffield were giving intimate talks and supported with their knowledge. The participants went from design concept to exhibition within one week, and the results are currently displayed at Tala’s new global headquarters, Tala Studios. (Vyner Street, London). 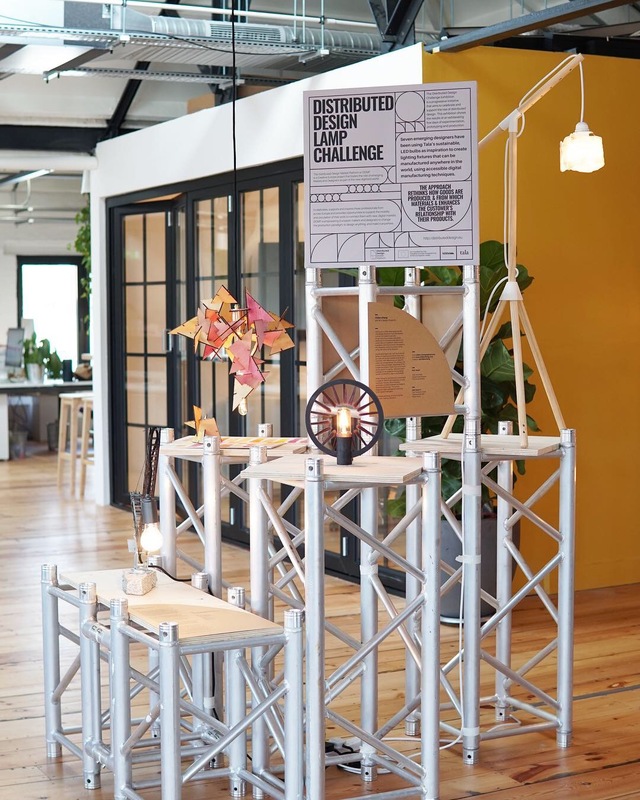 Four of the winning designs were awarded and prototyped and the Exhibition of the four Distributed Lamp Designs will be on display at Tala Studios until October 31st – so pop in! We present the winning designs of the Distributed Design Lamp Challenge and their designers below. The Lamp Designs were selected by their progressive and innovative use of material, and achievability while creating value for people and society or companies. “Distributed Design is a methodology that has an extremely academic grounding with utopian ideas at its core. With my entry I have aimed to create a system which can take these principles out of academia, with a design which could be implemented right now with access to one tool. “This project features two prototype floor lamps that represent alternate approaches to distributed design. The first prototype is a proof of concept to remind us that distributed manufacturing does not have to mean digital manufacturing. It attempts to show that we can achieve an interesting, functional design with local materials, simple instructions and only the most basic of tools. The lamp combines found objects with common hardware store items, and includes PVC piping, elastic bands and a log, though these parts serve merely as examples and the design should be customised for the user’s location –– a previous version included aluminium pipe for the stand and a London brick for the counterweight. “Soft Touch is a table lamp designed with a borderless distribution and reproduction in mind. The traditional process of manufacturing overseas with global distribution is no longer sustainable for our planet. Resource depletion, plastic oceans, and global warming are some of the reasons why designers need to be mindful of their design decision and the aftermath. By sharing its digital data, Soft Touch can be produced anywhere around the world, and be made with locally available materials and machinery. With different types of data, the maker can choose between 3D printing, CNC or laser cutting processes, depending on the budget and timeline. Plastic, hair, or corn husk can be used for the bristles. Alternative sheet materials can be applied for the ring design and the lampholder if a pipe is not available. “How can we use distributed manufacture to propagate strangeness? How can we complicate regularity? Distributed manufacture seems to demand simple, replicable designs. How, within these, might we show the uncertainty of our current partnership with the environment? This lamp idea was inspired from a piece of packing material. The material is made to be regular and robust, and its design allows it to warp in uneven ways. The look as well as the metaphor inspired the Frag Lamp. The name comes from the Latin frangere, to break, which is also the root of the word fragility. The structure is broken into three functions: the seating for the bulb at the center, the verticals that generate enough space for the bulb to shine, and the covering that fractures the light into a more complex pattern. It is the outer covering that offers the space for great customization — you can hang nearly any old flotsam off the surface, creating an irrationality encouraged by the design. “My designs are often inspired by the everyday, and this lamp for Tala was no different. I love taking something familiar and placing it in an unfamiliar context as this can make us consider these objects differently. This lamp was inspired by trips through London at night, watching cranes loom overhead as their lights flicker on. These temporary fixtures of the city are present in every urban landscape yet are so commonplace that their functional beauty is often overlooked. I wanted to utilise the precision possible with CAD CAM as opposed to traditional craft for this distributable design. This delicacy and detail is only possible when using these machines, so I wanted to celebrate this unique quality of this process. It was important to me that this lamp not only looked like a crane but functioned like one too, using counterweights to mimic their smooth movements, highlighting the complex engineering involved in these graceful machines. “The whole concept for this lamp was to create a sustainable, valuable and individual designed pieced which also fitted the outline of the brief; to be reproducible, valuable and distributable. This design is flexible to fit into whatever lighting scenario an individual requires: it can be configured as a desk lamp, a hanging lampshade/wall light- three lamps in one requiring only three materials: wood, dye and a laser-cutter. I wanted to design and create a flat pack piece which was easy to move around but was sturdy once configured and an interesting sculptural addition to its environment. A core aspect and focus of this and my work is to be sustainable. It is a 0 waste piece which can be cut from recycled plywood/local wood found by an individual and then customised further using dyes from plants or foodstuffs collected locally. I think it’s really important for people to be able to adapt and adjust a design to suit their needs and community, so though its reproducible by anyone in the world, of any age, it can then be tailored to suit an individual’s taste/scenario. With no fitted light source integrated, it also means it is flexible and reusable with the ability to be changed time and again. “For years, objects have been bought because we were attracted by their design and we liked something we saw. 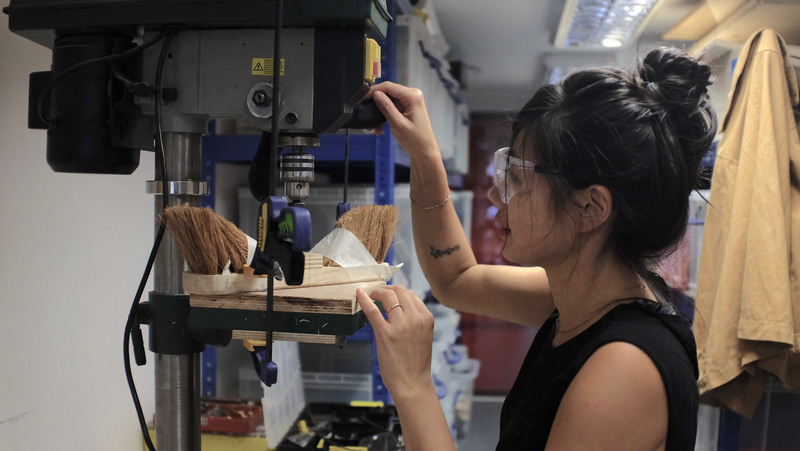 With the opportunities offered by distributed manufacturing and digital processes we can reverse that act: what if the starting point was the inherent quality and the positive impact of the material that the objects are made from? For the design of this lamp, I was driven by the use of a reclaimed and recycled plastic sheet, which offers a wide range of patterns and colours and can be manufactured by a CNC router. I wanted to explore the intrinsic quality of the material : by playing with stripes and different thicknesses, it creates a transparent effect, allowing a slight graduation of the light, revealing the depth and the visual quality of the material itself. More than a visual effect, the pattern also allows the material to bend more easily and create the lamp shade, moving from a 2D sheet to a 3D volume. The shade and components exist as a digital file, downloadable to be made locally on a CNC router. This allows the design to be editable : the length can vary, and adding some striped parts will allow to create a customisable shape, from a triangle to a polygon. The inside and outside components of the lamp are assembled with zip ties, avoiding any glue or nails. The lamp can be hooked anywhere in the house, as a portable companion or it can stand on its own.